The Baltimore Appliqué Society's 2012-2014 fundraiser was a raffle for our reproduction "Lady of Victory" quilt. The quilt is based on an antique quilt owned by Mary Koval, who gave her permission to the BAS to produce patterns with all of the proceeds from the sales going to the BAS. This Baltimore Album Quilt is unique as it is the only BAQ with a 1812 Baltimore Battle Monument block that has a Lady of Victory at the top. To make the 119" square raffle quilt and a second quilt given to Mary Koval, 50 members made blocks with 25 blocks going into each quilt. Other members created the borders, and inked and embroidered details on the blocks. The quilt was beautifully hand quilted by an Amish quilter in Kentucky. All of the fabrics were donated by Mary Koval who worked with Wyndham Fabrics to reproduce the fabrics from the original quilt. The patterns for the blocks were traced directly from the antique quilt. The BAS Lady of Victory was exhibited at The Quilters Hall of Fame in Marion, Indiana during hte July 2014 Celebration and Induction of art quilter Ruth B. McDowell. The quilt was gien great exposure and excellent lighting in the exhibit. It was undoubtedly the largest quilt in the room and an extra wide metal hanging rod was created on the spot. The display card included inofrmation about the work of the BAS and mentioned its patterns that are available for sale. When Phyllis Hatcher won the raffle quilt she decided her goal would be to display it so that others could appreciate and enjoy it. 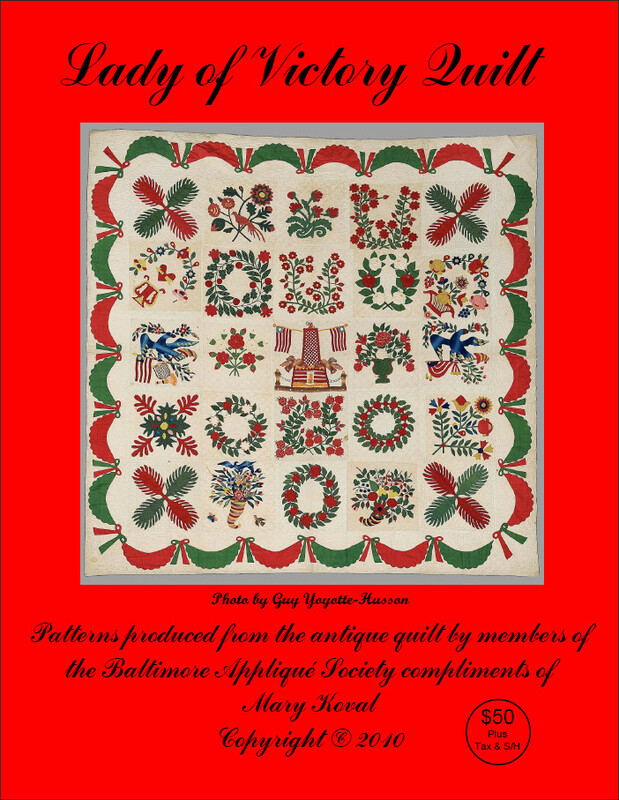 The pattern set includes all 25 blocks as well as a CD-ROM of pictures for each block, the border as well as a CD-ROM of pictures for each block, a color code chart and a history of this beautiful Baltimore Album Quilt (1846-1848). Each of these pattern sets made by tracing the antique quilt, include the inked details and embroidery that are found on the individual blocks. Note: The password has changed as of 10/10/18. Please check your e-mail for the new password. Forgot?